Spend time finding - and maintaining - balance before the holidays in the peaceful California hills on a historic family ranch. Enjoy daily yoga practices, fresh meals, paired wines, great friends, and nights under the stars at this pastoral haven. 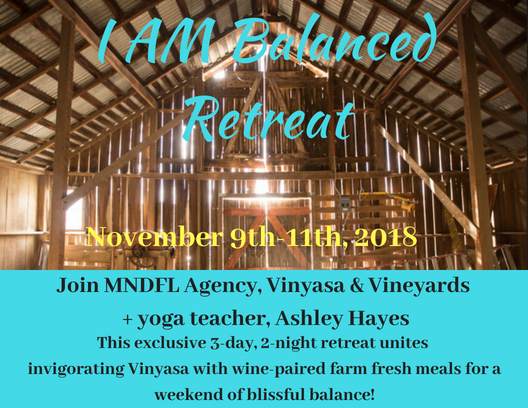 Join MNDFL Agency, Vinyasa and Vineyards, and San Francisco yoga teacher, Ashley Hayes, for I AM Balanced, a weekend retreat focusing on balance at its core. With fiery asanas practice coupled with calming restorative yoga, farm fresh delicious food expertly paired with wine, group study as well as time for personal reflection, this weekend together will integrate all layers of self to be fully at ease and balanced. 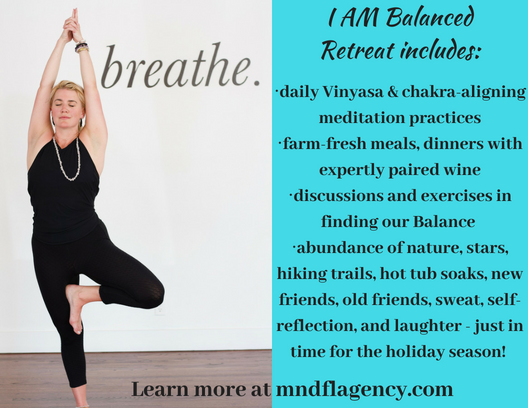 We invite you to become truly aligned and balanced with us for the approaching holiday season! SPACE IS LIMITED for this intimate gathering. So often we see retreats that are either exclusively yoga, early mornings, and light diets, or party weekends, full of an unconscious consumption of dalliances and delights. We thought, why can't there be a healthy balance of both? Why can't the body be moved, breathed through, well fed, and rested, as well consciously consuming local wines with new friends and old? This premise created Vinyasa and Vineyards, an experiential brand rooted in the love of both yoga and wine. As countless couples have a dedicated yogi(ini), and a wine enthusiast, within at least one (or both!) of them, we thought this could be a fun experience for all parties, from the most advance yogis to the dedicated wine fan. Our retreats are a beautiful respite and oasis, welcoming you and your significant other, groups of friends, or flying solo. This exclusive event is our first of this kind, but our company, Vinyasa and Vineyards plans on creating many more around the world.